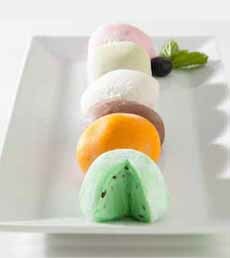  The bright colors of some mochi flavors add eye appeal (photo courtesy My/Mo Mochi Ice Cream). 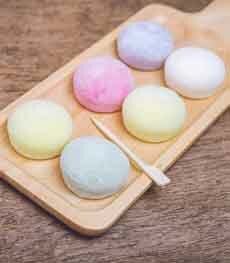 Mochi are ready-made for “portion control.” Eat one or the whole plate (photo courtesy My/Mo Mochi Ice Cream). 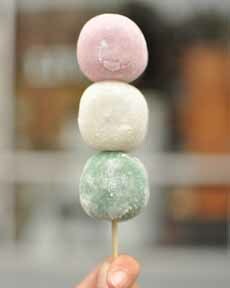 Food fun: mochi on a stick (photo courtesy DeeDee Paris). 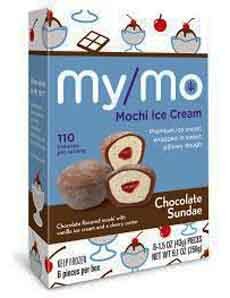 A favorite flavor, Chocolate Sundae, is tied with Vanilla Blueberry (photo courtesy My/Mo Mochi Ice Cream). Traditional mochi (filled but no ice cream) can be turned into little works of art. This little pumpkin is filled with sweetened pumpkin purée. You could also use chocolate, red bean or Nutella filling.Here’s the recipe from The Woks Of Live. Mochi (MO-chee) is a Japanese treat that’s ancient—reference go as far back as 794 C.E. * It’s also modern, adapting itself to ice cream in the early 1990s—in Los Angeles. The pillowy rice dough that’s the base of mochi is eaten year-round, but is especially enjoyed for special occasions and around the New Year, as a symbol of good fortune. And it’s our good fortune that mochi ice cream is now trending across the U.S…that more grocers carry it…and that companies like My/Mo Mochi Ice Cream tempt us with such high-quality, yummy flavors. First, allow us to go back to the beginning of the mochi tradition. Mochi is one of 10 traditional Japanese sweets, or wagashi (wah-gah-SHE). Daifuku mochi, filled with red bean paste. Sakura mochi, wrapped in a salted cherry blossom leaf. Kusamochi, a savory favorite flavored with Japanese mugwort, an herb in the sunflower family. Some pastry artists turn the balls of mochi into little pieces of art. 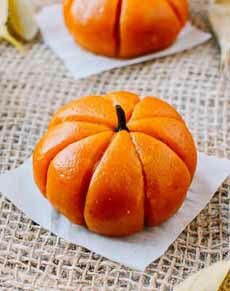 See the pumpkin mochi in photo #5. If you find yourself in a city with a Japanese focus, look for a wagashi store and have your fill. Minamoto Kitchen, our first introduction to the wondrous world of wagashi, has locations in London, Los Angeles, New York, San Francisco, Singapore and Tokyo, and offers online shopping. But no ice cream mochi. These are an American invention that was first launched commercially launch in 1993 in L.A., when the husband of a Japanese food store owner snacked at home on spoonfuls of ice cream wrapped in plain mochi cakes. The rest is history: Here’s the story of mochi ice cream. The rice dough surrounding the flattened balls of ice cream is colored to reflect the flavors inside (photo #1): chocolate, cookie dough, green tea, mango, mint chocolate chip, salted caramel, strawberry and vanilla. If you’re old enough to remember the joy of ice cream bonbons at the movie theater, these are the updated version of joy. The My/Mo Mochi Ice Cream brand is a favorite at THE NIBBLE. The company has just launched the first triple-layered mochi ice cream. Traditional mochi have two layers: the rice dough wrap and the ice cream inside. The new triple-layered products add an extra flavor in the center, the first “triple tastes” on the market. Chocolate Sundae, with chocolate mochi dough surrounding vanilla ice cream and a cherry center (photo #4). Dulce De Leche, with original mochi dough, coffee ice cream and a caramel center. S’mores, with chocolate mochi dough, graham cracker ice cream and a marshmallow center. Vanilla Blueberry, with original mochi dough, vanilla ice cream and a blueberry center. The most vivid flavors are the Chocolate Sundae and the Vanilla Blueberry, but all four are welcome in our home (and office!). The company also makes eight “two layer” flavors, non-dairy/vegan mochi, and ice cream five flavors of pints with mochi bits. The line is gluten-free, soy-free, and certified kosher (dairy) by OK.
And if you like to create desserts, there are plenty of recipes online for both regular and ice cream mochi. A quick ice cream/sweet fix. A flexible dessert (one, two or three pieces—or go whole hog—photo #3). Food fun. Turn mango mochi into pumpkins, passionfruit mochi into Easter chicks, chocolate chip mochi into frogs, etc. MOCHI TIP: Before eating, let them soften until you can press them gently like a ripe pear. Gnawing on frozen-hard mochi doesn’t give you the real experience. *This is the beginning of the Heian period, the last division of classical Japanese history. It spanned 794 to 1185 C.E. The period is named after the capital city of Heian-kyo, which is modern Kyoto. During this period in Japanese history, Buddhism, Taoism and other Chinese influences were at their height. †Ice cream novelties are single-serving frozen treats such as ice cream bars and pops-on-a-stick, Popsicles and frozen juice bars, frozen Twix and Snickers bars, packaged ice cream cones and ice cream sandwiches. “Bonbons” like mochi fall into this category.